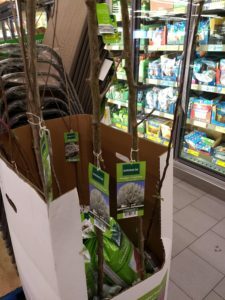 Every spring, Aldi sells a few small trees and bushes for your yard at great prices. 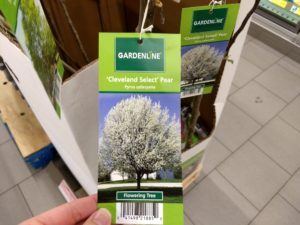 However, there is one tree you should avoid purchasing at Aldi or any other retailer: the Cleveland Select Pear Tree, which currently is on sale at Aldi for $14.99 as part of the store’s Gardenline product line. This tree also can be found at other large chain stores and nurseries, including Lowe’s, Home Depot, and a variety of online plant nursery retailers. Why should you keep this tree out of your yard? In short, the Cleveland Select Pear Tree and other ornamental pear trees are from China and are invasive and quickly spread in the U.S., crowding out valuable native species. Ornamental pear trees — which go by names such as Bradford Pear or callery pear, among others — have been heavily planted in towns and communities across the U.S. because they are valued for their beautiful flowers and quick growth. As a result, they have spread widely, popping up of their own accord in fields, under power lines, and even alongside interstates. They’re so common that if you see white blooming trees during the spring, they are most likely a form of invasive pear. By the way, these pear trees produce small fruits that are inedible to people, so they are not the same as the fruit we typically see at the grocery store. Ornamental pear trees are so bad for native flowers, bushes, and trees that the city of Fayetteville, Arkansas, actually set a bounty on them this spring, offering a free native tree to anyone who cuts down an ornamental pear. Native trees being offered in place of the pear trees include American plum, flowering dogwood, eastern redbud, hawthorn, and serviceberry. It’s ironic that some cities are trying to get rid of ornamental pear trees, and they are even banned in Pittsburgh, Pennsylvania, and Lexington, Kentucky, and yet these trees are still being sold at nurseries and retailers across the country. That’s because public awareness of the problem of these trees is small, but awareness is growing. The Missouri Department of Conservation states that ornamental pear trees were introduced to the U.S. in the early 1960s from China. All ornamental pears are from Pyrus calleryana, or callery pear, which is commonly known as Bradford Pear. Bradford is the oldest type of ornamental pear, according to the MDC, with newer varieties including but not limited to Chanticleer, Aristocrat, Autumn Blaze, and Cleveland Select, the cultivar Aldi is selling. Ornamental pears or callery pears were originally popular because of their beautiful flowers in the spring, and they are hardy and can survive in many kinds of soil. It was also originally believed that these trees were sterile, but now they are known to be able to reproduce. The MDC notes that people first began experiencing problems with callery pear trees about 15 to 20 years after they were planted. Callery pears have a weak structure, and branches often break or trunks split during storms. It doesn’t take a lot of wind or ice to bring down a callery pear tree. Some retailers say the Cleveland Select pear tree is a stronger cultivar that is less prone to breaking, but it’s still a bad choice for planting for another more troubling reason, which is that it spreads like a weed. The first is that callery pears have been overplanted in many communities. They are commonly seen in all types of neighborhoods, apartment complexes, and parks, and new home builders often plant them in their developments because they grow quickly and have attractive (albeit bad-smelling) flowers. The different varieties of callery pears are unable to reproduce by themselves, but they can cross pollinate and produce fruit when large numbers are planted close together like they often are in our communities. The second way that callery pears reproduce is through sprouts that grow at the base of the trees. They flower and crossbreed with the flowers of the tree from which they sprouted. Birds also eat their fruits and then spread the seeds along natural areas, fences, roads, and under power lines. As an amateur naturalist and conservationist, I belong to a native plant group on Facebook, which is what first brought my attention to the fact that Aldi was selling these trees. Several members of that group said they contacted Aldi to let the business know ornamental pear trees are a bad idea. “Thank you for sharing your perspective with us. Your feedback has been forwarded to the appropriate department for further review. You can get more ideas for planting alternatives at the Missouri Invasive Plant Task Force website or at this Missouri Botanical Garden link. Aldi’s Gardenline Cleveland Select Pear Tree is not a good choice because it is non-native and spreads quickly, crowding out important native plants and trees. The concern about this tree’s environmental impact is great enough that some U.S. cities are actually encouraging residents to cut down these trees. In addition, ornamental pear trees, including the Cleveland Select, are more prone to breaking and splitting during storms compared to native tree species, and the flowers smell bad. If you want a more environmentally friendly flowering small or medium tree, look for something native like a serviceberry or redbud.